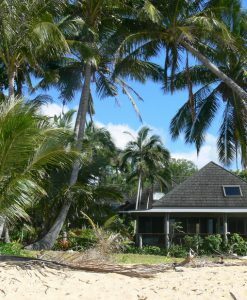 Dunk Island View Caravan Park is tucked away at Mission Beach within 50 metres of a magnificent white tropical sandy beach with views across to Dunk Island. 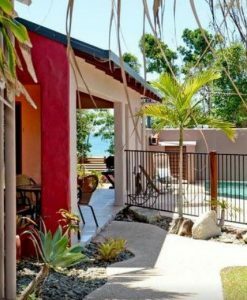 We are a pet friendly caravan park nestled among tall palms on six acres of lush green rainforest grounds. 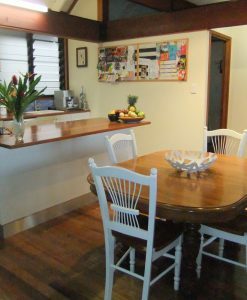 All our guests can enjoy free wifi, an equipped kitchen, which includes a fridge, freezer, stove, oven and TV. You can also relax in our swimming pool and cook up a feast on one of our barbecues. 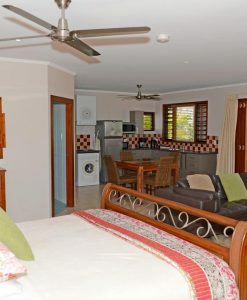 For those who prefer more homely comforts, we have eight fully-furnished and self-contained units with en suite bathrooms and air conditioning. Our caravan park is recently upgraded and we are pleased to offer all our guests clean and comfortable facilities. Our helpful staff will try to make your stay as magical as possible. If there is anything you need then just call at reception and we will see what we can do.